Click HERE for more about the Westlake Middle School Women’s Empowerment Assembly. 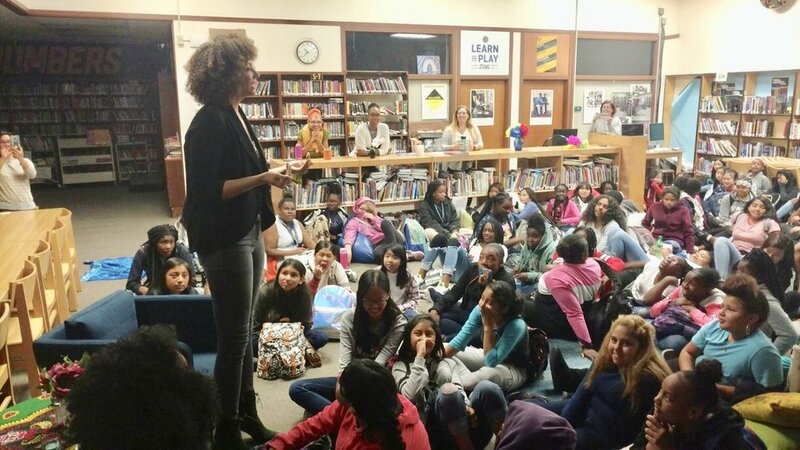 Recently I had the pleasure of speaking to a group of beautiful young women at Westlake Middle School in Oakland, CA. It was an amazing afternoon of positivity that Principal Maya Taylor spearheaded. I was honored to share my story and life lessons at the first Women’s Empowerment Day at Westlake. Check this Oakland Post article out for more details on the beautiful event. It was a complete blessing to speak to this room of young women that will change our world in so many different ways. While I pray that I impacted everyone who needed it, by far, the person who was impacted most on this day was me. While leaving my job of 13 years has been imperative and amazing, I have struggled with direction. There are so many things that I feel God wants me to do, it has been hard to trust myself to select where He wants me to go next. However while speaking at Westlake, He affirmed something in me that cannot be denied…no matter what I must continue to speak about confidence, bullying and standing tall in every way. I literally went through (and go through) everything in my life to help build others up. It is my life’s purpose. I can see Him working through me in amazing ways. I do not know how I am going to get there but what I do know for certain is that He will make it happen in His timing. The work He has for me is great and I will trust Him through all of it. I will emphatically move my feet and let Him beautifully connect the work together for His purpose for my life. Currently, I am in the process of revamping TallSWAG to not only be a space to stand tall in style but in all things. I aspire to inspire in all areas of life through the lens of my own. I want to do this through speaking, writing, lifestyle, events, design, travel and every other constructive way I can. If you feel compelled to connect in any of these spaces, please do. If you have a lead, open position or idea for me that aligns with my purpose, I dang sure want to hear it. God doesn’t waste anything and maybe you are reading this right now to link me to the next step in His plan for me. You never know and I sure don’t see any harm in putting it on the table. I want to be the light that He needs me to be and will work tirelessly to make it happen. I’m not above giving God a conduit to connect. He uses all of us and I will continue to walk down the avenues He presents to me. I am sure you have noticed that I have been posting a lot less lately both on my site and on social media. There are many reasons for this but the main and most important one is that I was on a Daniel Fast. What is a Daniel Fast you ask? The Daniel Fast is a spiritually based partial fast that is usually 21 days of abstaining from foods specified unclean by God in the Laws of Moses. During the fast you are to focus on God and be in intense prayer, Bible study and reflection. The intention of the fast is not about the diet yet the change in diet is a tool of focus to draw you closer to God. So what do I have to give up? *Quick Daniel Fast Tip: Chipotle and Jamba Juice are both Daniel Fast friendly. I wouldn’t recommend eating them often during the fast but they are great in a pinch. Jamba Juice has all fruit smoothies and Chipotle has sofritas instead of meat. Add their grilled veggies, brown rice, guacamole and other natural ingredients for a filling on-the-go meal. I am certainly not a chef but here are some of the random things I made and ate while on the fast: Vegetable based protein (you can find at whole foods and Target. For the best results, blend it with peanut butter, almond milk and fruit)/Kale, fresh tomato, walnut and garlic almond milk sauce over whole grain penne pasta/Hummus with toasted pine nuts/Daniel Fast cookies/Preparation for the fast (super important)/Almond butter, bananas and strawberries on a brown rice cake/Daniel Fast Chili with a kale, apple, balsamic-olive oil salad and strawberry, lime and mint water/Whole grain oats with almond milk, almond butter, cinnamon, pecans, blueberries and raisins/Delallo Organic Whole Grain Pasta (which was my favorite brand on the fast)/For more Daniel Fast recipes, click HERE or the photo. And that my friend is it. No dairy, sugar, coffee, meat, sweeteners, leavened breads, solid fats, fried refined or processed foods. I know this list is daunting but whatever you do, don’t stop reading now. I can’t even lie. The first 3 days were hard. I found myself completely addicted to coffee. It was sad really. I come from a family with addictive tendencies and because of that, I have never tried even a sip of alcohol or any type of drug. I don’t want to start because I never want to finish. By no means am I comparing coffee to alcohol and drugs but as soon as I stopped drinking it, it became very apparent that my body was addicted to it. I had a terrible headache and literally couldn’t keep my eyes open. It was a humbling reminder that gluttony comes in many forms, even in a sweet cup of coffee. Throughout the 21 days I dropped 11 pounds and after the first 3 days had an amazing amount of energy that I was not expecting. My skin cleared up and I really enjoyed finding different ways to cook the food that was included in the fast. To be honest, the nutrition part of the fast was quite easy for me. As a matter of fact, I plan to extend it in many ways. While I will enjoy sugar, meat, coffee and fried foods from time to time, giving them up showed me how much I do not consistently need them. The spiritual part however, was a bit more challenging and incredibly revealing. As I dove in to the plan, I began reading the Bible more and really praying specific prayers about things I am struggling with. I became frustrated because this practice is not something I should do just on the fast. This is something I should do in my everyday life. Why does it take a fast for me to spend consistent, quality time with God? It shouldn’t and moving forward it will not. For me, this spiritual slap in the face in itself made the fast successful. I love God, he is the center of my life, but I need to spend more time with Him plain and simple. Another thing began to occur (especially towards the end of the fast)…I started being attacked from every angle. A string of disappointing, soul stirring things arose that just baffled me. I was putting in the work, so why was this happening? Honestly, I let them get the best of me until I realized that a worthwhile walk will never be easy. This walk with HIM was never promised to be clear. In fact, Christian’s are targets for challenges. Tests and trails are the sand paper of our lives that shape us in to the exact person that God needs us to be. This is a lesson that we continually learn throughout our life and I certainly heard it loud and clear on this fast. Overall, the fast revealed weaknesses in me that need a heck of a lot more training both spiritually and nutritionally. It slowed me down, showed me myself and I am incredibly grateful for every single moment of it. Ignorance is not bliss. Many people walk through life with spiritual blinders on thinking that they are right with the Lord, while all the while your steps are going in the wrong direction. No matter where you are in your walk with Christ, take time to slow down and assess your relationship with Him. This time I did this with the Daniel Fast and we must live our lives doing this in various, continual ways. I look forward to sharing in this process with you! For more on the Daniel Fast, this was my go-to site for information and recipes. It really helped me throughout my 21 days and I hope that it helps you too! THE ULTIMATE DANIEL FAST. Stand Tall every day, in every way.